← A dog in a Winter Wonderland..
We want to thank everyone for the Christmas responses and pictures, it is so great to hear and see how the dog are doing in their “Forever Homes.” Julie wanted to share this picture of Rosie (CH. Timbers’ SheTsabo Tequila Rose), to her it exemplifies the meaning of Christmas. Rosie lives with Chris and Davian and her best buddy, Winston in Colorado. 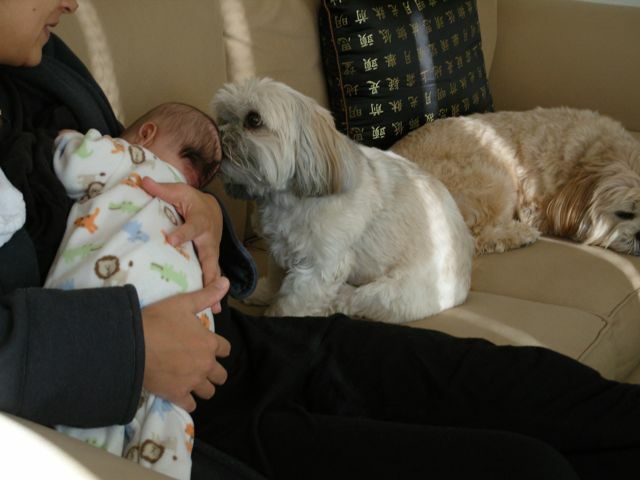 Who says Lhasas aren’t good with children? ?